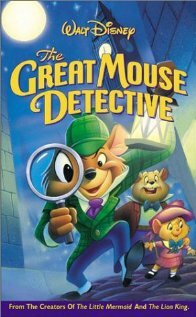 The Great Mouse Detective is one of my favorite animations. Not because of the animation itself (there are many better quality ones), but because of the story and the quality of the voice actors involved as well as the imagination that went into the settings, timing and the songs. The story is the first in a series of five books by Eve Titus. They are the story of Basil (obviously Rathbone) and his compatriot Dr. Dawson who live in the wall at Baker Street. The complete series moves Basil through London, Switzerland, Asia, Mexico and Texas. Unfortunately, Disney Studios chose to make only the one animated cartoon but it was done exceedingly well. 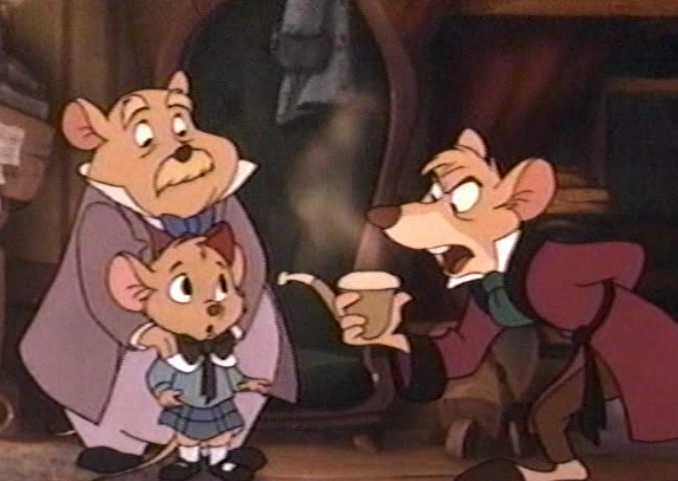 The Great Mouse Detective is the story of the first meeting of Basil (Barrie Ingham) and Dr. Dawson (Val Bettin). They are brought together by a little girl mouse named Olivia Flaversham. Olivia is seeking the great Basil’s help in finding her father who has been kidnapped by the arch nemesis of Basil, Ratigan (Vincent Price). Father Flaversham is a clockwork toy maker and Ratigan has a sinister plan for the Queens Diamond Jubilee that requires Flaversham’s help. It has always amazed me how cartoonists match the drawn character to the voice. Vincent Price was the perfect choice for the villain, Ratigan and Ingham is just right as Holmes. Val Bettin as Dr. David Q. Dawson plays very much the traditional Watson. He is well intentioned, intelligent and just one step behind, no matter what the scene. Dawson is neither Bruce nor Burke but somewhere in-between. If you are a Holmes fan and do not have this film you need to get it. Sit back, drink a pop and enjoy the singing. You will get up humming “Ratigan, oh Ratigan, Hmm, Hmm”..
Val Bettin was born 1 August 1923 in LaCrosse, Wisconsin. His father was a candy maker and his mother instilled a love of literature in the young man. By his 20’s Bettin was deeply involved in acting and in 1948 he went to England where he studied at the Royal Academy of Dramatic Art. In England he met and married his wife Hildy and returned to the states where Bettin continued to act and became a drama teacher. It was not until 1980 that Bettin made his movie debut in the film Somewhere in Time with Christopher Reeve. The Great Mouse Detective moved Bettin over into the voice over arena and he was in constant demand. Bettin has done voices for Aladdin, Gargoyles, Tarzan and Shrek to name a few. Bettin and his wife had a son and two daughters. Mrs. Bettin died in 2007. This entry was posted in Afghanistan, Doyle, Holmes, Uncategorized, Watson and tagged Great Mouse Detective. Bookmark the permalink.